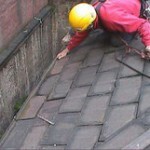 G&A Roofing Services London is a leading firm of roofers. We specialise in abseiling in the London area. Abseiling is a technique that offers a cost-effective and safe way for roofers to work at height. Also known as Industrial Rope Access, abseiling allows our roofers to work safely while avoiding unsightly scaffolding, ladders or other access machinery while they’re carrying out roof repairs or chimney reparation to your London property. Abseiling is a specialised technique that requires skill and dexterity to enable us to provide high quality professional care for your property. Our roofers have undergone extensive training and have many years of experience in this area. This important addition to our services in London means that we are able to take real care when carrying out repairs to your property. For example, a roofer who can abseil is less likely to impose damage on your property while fixing another problem such as scaffolding, which can harm paintwork and adds extra time to the project. We extend this specialised service to all types of properties in the London area. Contact our team of qualified roofers for help on 020 7205 5785. The team of roofers at G&A in London follow strict health and safety guidelines for abseiling and before we start any work, we’ll carry out a risk assessment. Each abseiler involved in industrial rope access work must go through extensive training. The roofer will have two ropes, one for added safety if anything were to go wrong with the first safety rope. The ropes will be suspended from a safe point on the structure with the addition of independent anchor points. There will always be a second roofer on hand to observe that nothing goes wrong while the roofer is abseiling. Heavy tools will be suspended independently so that the roofer only has to contend with small tools while he abseils, preventing the safety hazard of dropping equipment. With over 25 years of experience in the roofing trade, G&A Roofing is a reliable firm of roofers with a track record for safety and professional roofing solutions. Our team of qualified roofers in London are fully up-to-date with health and safety regulations and will carry out a risk assessment before they start any work on your property. That’s why we’re a leading roofing team that our customers count on for affordable roofing and safe, superior workmanship. What Are The Benefits Of Abseiling London? Provides an efficient method of accessing difficult to reach areas. Minimal disruption to the surrounding area. Equipment is removed overnight so you can get back to normal when our roofers are finished for the day. Less risk of damage to your property, for example, from scaffolding that is being erected or dismantled. Dramatically reduced working hours due to easy set up of equipment means that costs are kept down. Find out how our roofers can help you keep your property in top condition, contact the team in London on 020 7205 5785. Can you please contact us in regards to Abseil works urgently please in the London W1G area to see if this is possible. Water ingress has been identified into a flat on the sixth floor of a flat roof at Spencer Close, Regent’s Park Road, N3 3TY. We would need someone to attend there and check the gutters and area to investigate where the leak is coming from. Could you please quote for the cost of this? Hi, we are in a 4 story building and we need the downpipe from the roof gutter replaced or repaired. There is direct access to the roof from the top floor flat skylight. Can you please advise approx costs involved.